Join us on December 14 for a special performance of Dickens' classic. 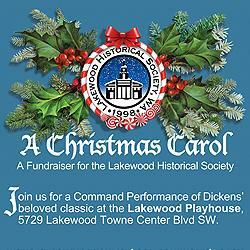 Lakewood Historical Society partners with the Lakewood Playhouse for a command performance of Dickens' beloved classic, "A Christmas Carol." Make a contribution to your community even Scrooge would approve of. Celebrate the Holidays by helping the Lakewood Historical Society preserve and celebrate our local history! The performance begins at 7 pm, Thursday, December 14. The Lakewood Playhouse is located at 5729 Lakewood Towne Center Blvd SW next to the Transit Center. Tickets are $20 and available at the museum (6211 Mt. Tacoma Dr. SW Lakewood, WA 98499).